You'll wish the sun would go down faster so you can light a fire. 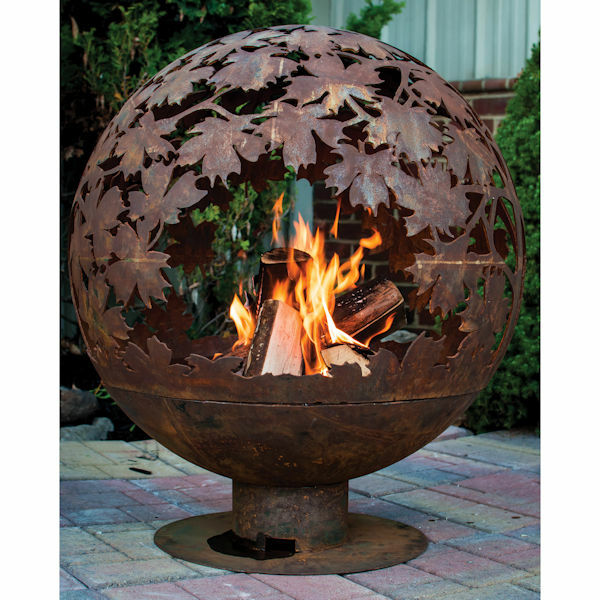 One of the most beautiful fire globes we've seen is a curving canopy of autumn leaves. Flames flicker through and around them, outlining their shapes in an ever-changing display. Sculptural globe is laser-cut from 3mm-thick steel so it's sturdy and long-lasting. Globe and base separate for easy clean-up and transport. Large is 24" diameter, 28" high; X-Large is 32" diameter, 36" high. Allow 3 weeks. No rush delivery or gift wrap. Item can only be shipped within the Continental US. Extra shipping charges for this item: $79.95.